Despite their appearance the We/Wobe masks above show no evidence of age or use and were probably made to be sold. Living in along the western edge of the Ivory Coast, the Wobe and their neighbors the Guere share numerous customs and beliefs. Although they are separate tribes, the two peoples are often referred to as the We, whose name means "men who easily forgive." 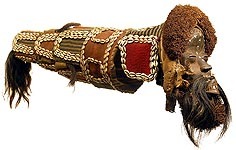 The ferocious aspect of We/Guere masks - bulging eyes, open mouths and sometimes protruding horns - accounts for their identification as "war" masks but, according to Bacquart, they are worn primarily during funerals and - in a"detective" capacity - to single out guilty persons. We carvers seem to have focused their skills on carving powerful face masks to which paraphernalia such as cowrie shells, bells, nails and feathers were attached. These applied pieces were thought to reinforce the power of the mask. Wobe masks have protruding globular eyes and enlarged lips. 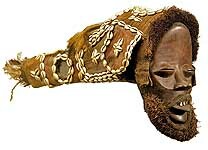 The horns found on Guere masks are usually absent from Wobe ones. -----From The Tribal Arts of Africa by Jean-Baptiste Bacquart.